In the late summer of 2003, Jerald Melberg Gallery hosted a show of art called Just Desserts, featuring works of art with a dessert-based theme... the works included images of cakes, cookies, and other sweets. When I visited the show, a particular surprise was two dozen very lifelike donuts hanging on the wall. Created by Tom Pfannerstill using a material called Hydrocal, a very hard form of plaster, the donuts are painted with different materials to produce the illusion of real donuts. Each donut has a hole in the back, so they can be hung on the wall. Included in my assortment of donuts are a simple glazed donut (reminiscent of the famed Krispy Kreme glazed donut), a chocolate donut with white powdered sugar, a donut frosted with white sugar, a cake donut with chocolate icing, a chocolate cake donut with white icing, a cake donut with zebra-striped icing, and a glazed donut with sprinkles (undoubtedly, this would be Homer Simpson's favorite donut). My favorite donut is, of course, the Krispy Kreme glazed donut. 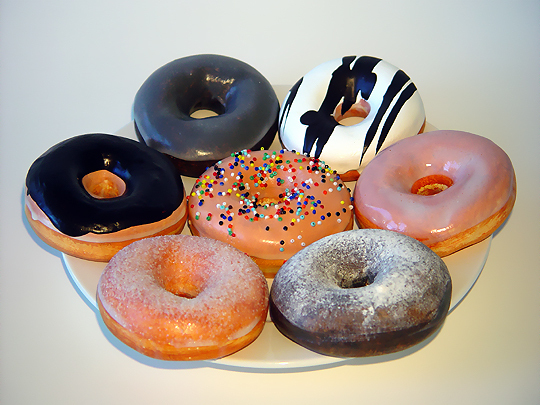 These donuts are quite realistic in appearance, and they appeal to the silly side of me. Pretty cool!